Everett Middle School combined empathy with education last night as underresourced, predominately Latino families from the Mission came together to share their concerns and traumas over San Francisco’s continuing housing crisis. 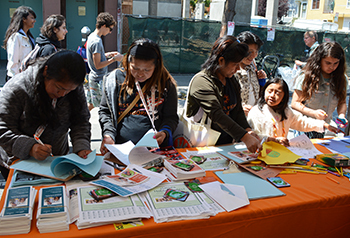 Held by the Mission Promise Neighborhood (MPN), this was the second such event of 2014. The first “Housing Town Hall” was held at Bryant Elementary School in March, with families sharing their traumas and asking for solutions. The ongoing challenges faced by low-income families Mission families were corroborated by a federally mandated MPN community survey that was done in spring. This survey showcased the fact that 95 percent of MPN families are renters versus 64 percent citywide, based on a San Francisco Planning Department study from 2012. Also, according to the MPN survey, 85 percent of Mission families are spending over 50% of their income on rent. Last night’s “Housing Town Hall” built knowledge of housing options for families and engaged them in solutions. The evening’s agenda commenced with a warm welcome from Everett Middle School Principal Lena VanHaren. Next were inspiring words from neighborhood activist Oscar Grande of People Organizing to Demand Environmental & Economic Rights (PODER). Grande asked the crowd such questions as “Who is living with relatives?” and “Who has fear of being evicted?,” with hands rising in the audience. There was then a panel featuring: David Campos, District 9 Supervisor; Ken Tray, United Educators of San Francisco; Kevin Truitt, Associate Superintendent of the San Francisco Unified School District; and Scott Wiener, District 8 Supervisor. Each got up to address the crowd. Tray explained that real estate company Redfin has found that no teacher in San Francisco can afford to live in the city, a startling fact. Finally, there were a trio of bilingual sessions—facilitated by Causa Justa :: Just Cause, Hamilton Family Center and the Mission Economic Development Agency (MEDA)—on the subjects of housing rights, housing options and prospective direct action. Fear was palpable. Anxiety was high.